I use this jar for about the first 5 minutes of singing time. 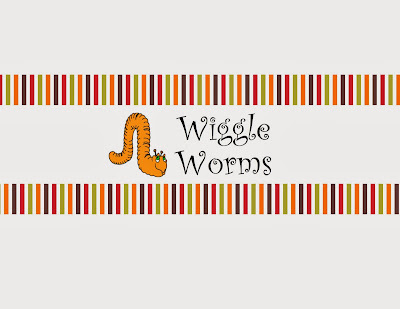 I tell the kids I need my best wigglers to pick our wiggle songs. They know the drill and go to town wiggling. I then get to pick the wiggliest one (haha, so fun)! They come and choose a worm and we sing the song (with actions if it applies). My original plan was to only do this in Jr. Primary but I have found that Sr. Primary enjoys it just as much. My 11 year old boys crack me up wiggling!! We sing about 3-4 songs from the jar each week. I like it because we get to sing other songs that we otherwise would never, ever get to sing! It's also a great tool for a last minute substitute or if your singing time wasn't long enough and you need to kill a little time. I keep the jar in our Primary closet so it's always available (and it's one less thing to tote to church)!! I've tried to pick "classic" songs that everyone SHOULD know but some of them are not very familiar still. So I do have words printed out on a sheet of paper if I feel the kids don't know the words to a particular song (like the song Saturday). For my jar I just covered up a plastic jar I found around my house. Nothing fancy! You can download and print my label document HERE if you can find a jar where it will fit. 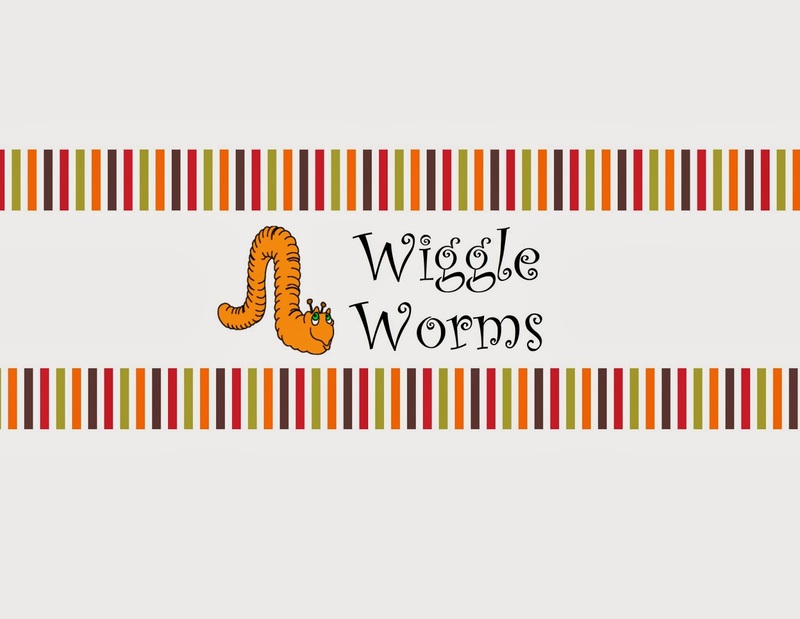 Each wiggle worm has 2 songs written on them - one song on each side. I can choose between two songs which has been a nice option. You can download a list HERE to give to your pianist. *The songs marked above with a (*) are songs we also sing in nursery. If a nursery song is picked and I have my nursery props (find details on my nursery post HERE), I pull out those props - like Follow the Prophet. I pull out my President Nelson stick and we follow the leader around the primary room while we sing. I was able to attend the Pat Graham workshop last Saturday (fabulous!) and am going to use one of her ideas...I only changed a few things for Jr. Primary because they cannot read. She posted the following diagram on the board as she was "teaching us" this song. She had us help her fill in the part that says "3 key words here" with key words from the first verse of IILWMH for each phrase. She told us this is the pattern she found in the song. Phrase 1 and 2 and 4 have a very similar melody. Phrase 3 is a little different. If you sing it to yourself and follow the pattern above, it may make some sense. Since I'm working on the 3rd verse this week, I'm going to have the Senior Primary help me fill in 3 key words for each phrase and then we'll sing that phrase and go on. If we have time, we'll review the first and second verses the same way. Maybe have the kids themselves come write them on the board - they love that! Pat also suggested as you sing each phrase, you move your arm in the air to the pattern of the line (move it like a rainbow going across the sky). For the 3rd phrase you'd have 3 smaller movements to follow the pattern. The circles above the 3rd phrase represent getting loud and softer. Pat suggested to start out singing phrase 3 quietly (small circle) then gradually get bigger (bigger circle). But she thought singing the last word (which is "peace" in all 3 verses) loudly didn't quite jive so instead, get quiet again. And have the kids watch you closely while you direct it. Then she also suggested to try having the kids only breathe at the end of each phrase. So that's all for Senior. I also have my heart sticks that I've used all month (see previous post) and we'll use those to make our "rainbow" patterns in the air. We'll also work on trying to only breathe at the end of the phrase. Verse 1 objects: child (doll), walk (I'll have a child come hold his/her shoes), scriptures (I'll have a child come hold his/her scriptures), heart (heart shaped something). 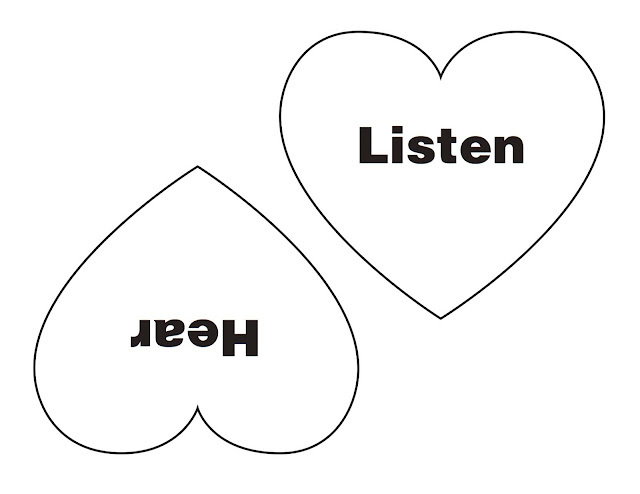 Verse 2 objects: hear (2 big ears cut out so a child can hold them up to their ears), earth (a ball), prophet (picture of President Monson), heart (heart shaped something). I don't know if this will make sense if you didn't actually see it done at the workshop but it really is a great visual. I feel like I know the song so much better with the melody pattern on the board. Leave a comment if you have questions. 1. Where can I hear the Savior's voice? 2. Who teaches us how to live righteously? 3. Who speaks quietly to us? Invite the children to listen for the answer as they sing and to signal (by folding their arms, standing up, or touching their ears) when they sing the answer. have the children sing the answer with you a few times. Write another question on the board and repeat." I posted on the chalkboard 3 pictures (one for each verse): A picture of a child reading the scriptures for the 1st verse, President Monson's picture for the 2nd verse, and a picture of a child receiving the Holy Ghost for the 3rd Verse. Then under each picture I typed up the words so each verse to fit on one sheet of paper and then hung the 3 verses under its corresponding picture. Use my "Posting Words" document for this song HERE. I used a CD player and had IILWMH on CD which contained the words being sung. Then I wrote question #1 on the board while we listened to the first verse. I had the kids raise their hand once they figured out the answer and we answered it all together. Then we sang verse one. I repeated the 2nd and 3rd verses the same way. Then we just sang the whole song through. I had them repeat the chorus a few times until they could sing it without using the words on the board (if they could do it, they turned around to face the back wall) since it is repeated 3 times and fairly short and simple. Next week I'm going to do a word scramble for the 1st and 2nd verses for Sr. Primary. To make the word scramble, simply download my document HERE and cut out each word using the lines are your guide (I have another document HERE that includes the 3rd verse but doesn't have the guide lines for cutting them out). To make it simpler, I'll scramble each phrase (each document is a phrase) but each phrase will be in order . For example, the phrase "If I had been a little child when Jesus lived on earth" will be row one and the words within that phrase will scrambled. Row two will have the next phrase scrambled "I would have liked to walk with Him and listen to His words" and so on. There are 8 phrases in the 1st and 2nd verses so there will be 8 rows. We'll start out by singing the 1st and 2nd verses using the words I typed up last week (see above) and I'll tell them they need to try to memorize the order. I'll remove the words and we'll work on the first phrase. I may time it and see if 2 or 3 kids can get phrase 1 in order in 1 minute. Then I'll bring the words back out and we'll check the answers. If it's wrong, we'll correct it and re-sing it. If it's right, we'll move on to the next phrase. I will also post the corresponding pictures that I used last week (see above) just so they can get a broad idea of what the verse is about. Find my lesson plan for teaching for Sr. primary HERE and teaching the 3rd verse HERE. 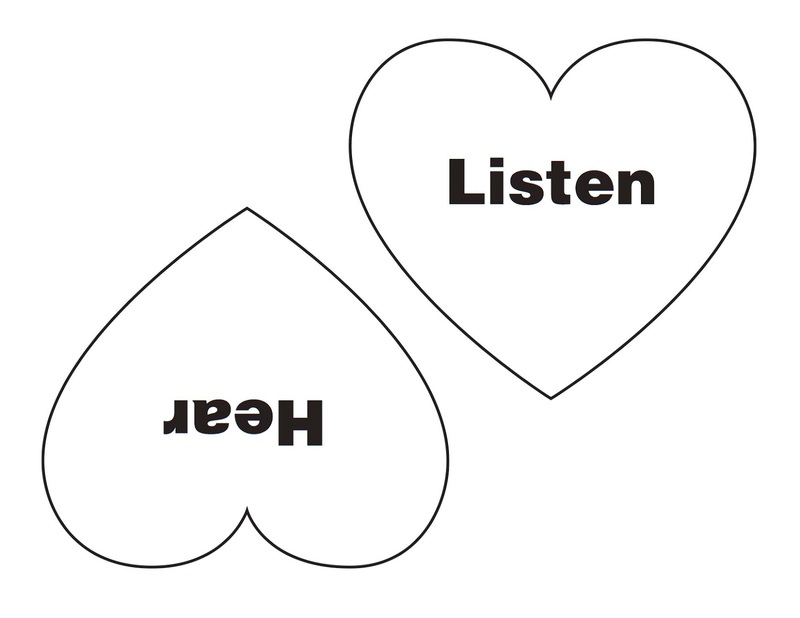 "Before singing “If I Listen with My Heart,” give each child a paper heart and ask them to write “Listen” on one side and “Hear” on the other side. Explain that these words are repeated several times in the song. Ask the children to show the correct side of the heart when they sing that word." I downloaded these hearts from lds.org HERE and printed them on red paper. I then glued the 2 hearts back-to-back on a stick. So we just went over the short chorus of the song a million times because it says "listen" and "hear." I called up a child to come up front and help us with the task. Everyone got a turn. They loved having something to hold. Then this week, I think I'm going to bring pictures that correlate to the words in the 1st verse (Christ with children, Christ walking, a child reading the scriptures, another picture of the Savior) and we'll point (using our heart sticks of course!) to the right picture that matches it. Maybe I'll eventually scramble the pictures so they are out of order or I'll move them around the room so the kids have to turn around and point, etc. I'm convinced that the best thing to do for young kids is give them something for their little hands to do. Either actions or something to hold.